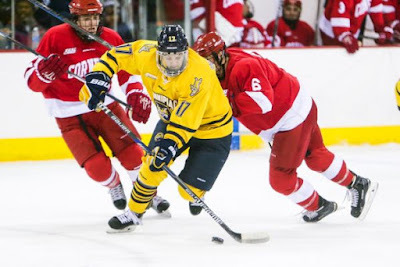 The defending back to back Cleary Cup champion Quinnipiac men's ice hockey team was officially dethroned on Friday night in a 4-1 loss to Union College in front of 2,172 fans at the Achilles Center in Schenectady, New York. The Bobcats came into the game with a slim chance at the Cleary Cup but a poor two minute stretch in which they gave up three goals sunk any hopes of the Bobcats winning another regular season title. Union swept the season series from the Bobcats for the first time since the 2009-2010 season and secured a first round bye in the process. Junior Chris Truehl got the start in net for the Bobcats having last played against Yale two weeks ago. For three quarters of the first period the teams played a back and forth even game. The Dutchmen broke through at the 14:18 mark of the period on a J.C. Brassard goal from Cole Maier and Ryan Walker. From there the flood gates started to open up. Thirty-two seconds later Brett Supinksi scored his sixth goal of the season with assists from Mike Vecchione and Nick DeSimone. Craig Martin got called for a tripping call a second after the goal was scored giving Union an immediate power play. Eighteen seconds later Connor Clifton took an interference call giving the Dutchmen a five on three advantage. Less than a minute later Union capitalized on the two man advantage when Spencer Foo potted his 21st goal of the season from Sebastian Vidmar and Jeff Taylor giving the Dutchmen a comfortable lead going into the first intermission. Freshman Andrew Shortridge replaced Truehl to begin the second period. The period was penalty infested with the teams combining for ten minor penalties. A boarding call on Tim Clifton at the 15:37 mark gave Union another power play which they immediately capitalized on a little more than thirty seconds later on Mike Vecchione's 24th goal of the season on assists from Jeff Taylor and Spencer Foo. Quinnipiac scored their lone goal of the game when K.J. Tiefenwerth took a loose from the corner and wristed the puck on goal where it deflected off a Union defender and into the net for an unassisted goal. Quinnipiac through two periods only had 14 shots on goal, a very low total for them. They only managed five shots on goal the entire third period finishing with a season low 19 shots for the game. The teams combined for five more penalties in the third period. Andrew Shortridge finished the game with 16 saves while Alex Sakellaropoulos returned after missing four games with a knee injury made 18 saves in the win. The Bobcats fall to 16-13-2 (10-8-1 ECAC) while Union improves to 21-8-2 (14-4-1 ECAC) as they inch closer to the Cleary Cup title. Quinnipiac concludes its regular season road schedule tomorrow night at the Houston Field House in Troy, New York when they take on RPI at 7pm.